Some might remember Charlie from presenting Children’s TV show, Rainbow, but she’s also one of the UK’s most respected songwriters. For Ventnor Fringe she’ll team up with multi-instrumentalist Julian Littman of Steeleye Span and and virtuoso double bass player, Gareth Huw Davies. The youthful, invigorating, and fiercely independent Ventnor Fringe Festival is celebrating its tenth edition this year and the Isle of Wight Venue Campaign enhances the programme with new, and returning shows. 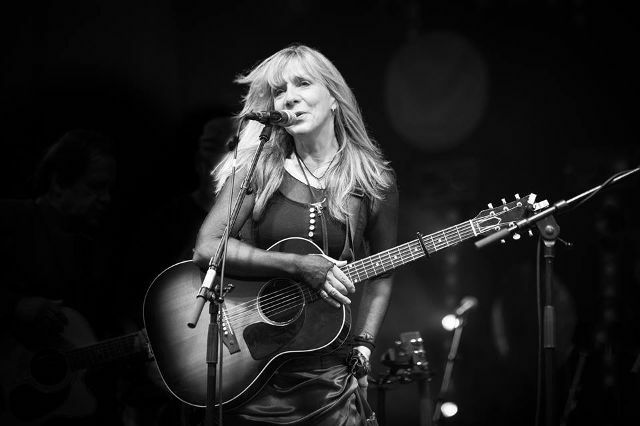 The Acoustic Halls of Holy Trinity Church, Ventnor will resonate to performances by the wonderful Charlie Dore on Friday 26th July (book now). Although best known as a respected songwriter for others, Tina Turner, Status Quo, and Paul Carrack, Charlie has enjoyed a multi-faceted career, that includes acting, comedy improvisation, writing for radio, and composition for TV and film, as well as performing with her band. Signed by Chris Blackwell in 1978 to Island Records, her first Nashville-recorded album produced the single ‘Pilot of The Airwaves’, which became a bit hit in the US. After working for Thames TV presenting the popular 70’s Children’s TV show, Rainbow, she went on to writing ‘Ain’t No Doubt’ for Jimmy Nail, ‘Rain, Tax, (it’s inevitable)’ for Celion Dionne and Strut for Sheena Easton. She quickly swaps instruments, and stories of a life led in the company of friends and colleagues like Eric Idle, George Harrison, and Harry Nilsson. Her ninth Album Dark Matter has been widely applauded to date winning both Album Of The Year and Best Lyrics from the USA Indie Acoustic Project 2018 and described as Metaphysical themes versus small dramas with humans routinely baffled by their own innerspace. A homegrown project in collaboration with multi instrumentalist Julian Littman of Steeleye Span, and virtuoso Double bass player, Gareth Huw Davies, who works with Chrissie Hynde (The Pretenders) and Sir Willard White. The event takes place at the wonderful Holy Trinity Church, Ventnor on Friday 26th July 2019 at 7.45pm (doors 7.15pm). Tickets are priced at £12.50 each are available from Ventnor Fringe Website or in person (Church Street, Ventnor).